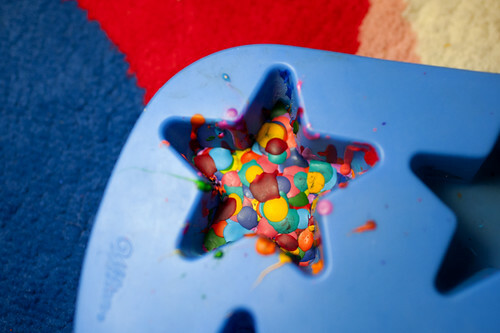 When I was younger, I loved melting crayons with my dad into different shapes. So I searched around my apartment for neglected crayons to melt down into a fun shape so that I would want to use them more! to make the most epic crayon ever! I was so excited to try it out that I covered my floor with a roll of giant paper so that I can doodle all over. 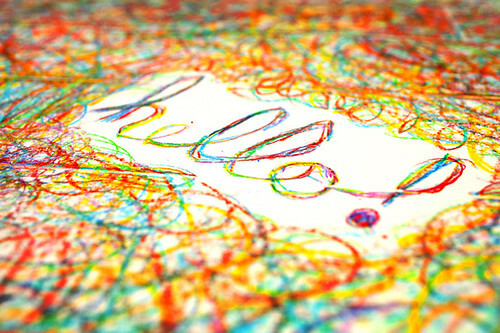 The most colorful hello ever! LOVE THIS. we all need to be kids more ofte. haha this is awesome. I need to get some crayons. Is it weird that I miss the way they smell? Never knew you could melt crayons! 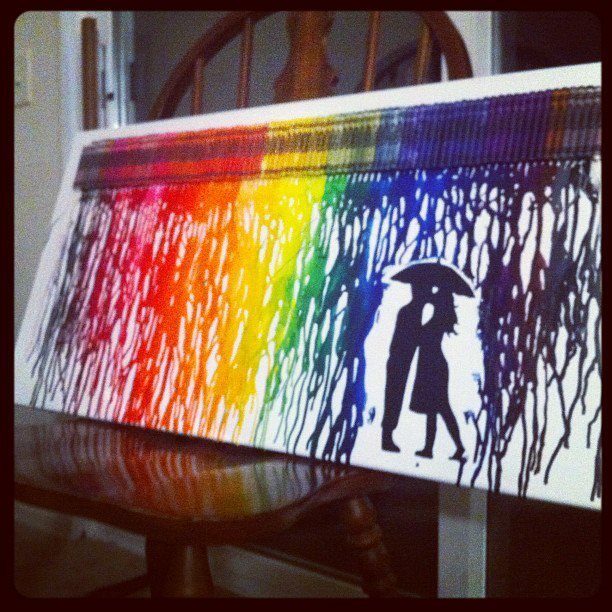 Pretty awesome though :) And I love how the colors all run through another when you use your handmade crayon! I LOVE IT!!! How do you do it? I've been meaning to do this for a while now! Need to get my hands on some crayons! This is what I thought of when I saw 'melting crayons'. Would be nice to know how do you actually melt them? And put them there to make it that shape? I'd love to try do that myself as well! You know you'er so inspiring person. Well you probably already heard that a couple of times but... Here I am still letting you know that. i thought this is what you did. looks like something up your alley! Funny! Never thought you could do it with crayons. When I was a kid, we always did it with candles. I used to melt crayons onto paper that i had lade onto an electric skillet. I probably could have caused a fire, but i made it work and i loved it. One of my fondest memories. Love this! I am inspired now! Love it! Looks like you had fun! 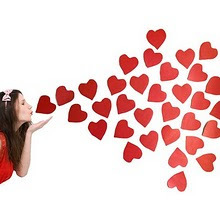 I think you are AWESOME!!!!!!!!!!!!!!!!!!!!!!! i need your apartment, katie. i NEED it. You never run out of ideas! It's unreal. great idea! you're so awesome! I remember making crazy melted crayon patterns on black paper with an iron and wax paper... too much fun and oh so therapeutic!! I have never done this before, but I have always wanted to. This is going on my life list right now. Thank you for the inspiration! Amazing!!! Love this idea and love the star crayon you created. .I love the smell of melted crayons, yes im wierd but you are right, that is deffinately the most epic crayon ever! Love the hello doodle too! Such a cute idea! How did you melt the crayons? Such a fun idea! I have to test this too!! I used to do the same ! It's sych a good idea ! ahh! you have no idea how much i want to hug you right now! i'm doing this as soon as i get home from vacation! Definitely going to make this!! What I like the most about your new crayon is that it is in the shape of a star! I am obsessed with stars. Anyhow, keep posting!! I love your blog. I've always loved this idea! The results are always so much fun! Wow, that looks like it was tons of fun. When I was a kid, my friends and I used to melt crayons into bottle caps that we used in a sidewalk game of scully. Thanks for bringing back great childhood memories. So fun!! I love your ideas! Your crayons looks so new btw! haha!! so pretty!! This is such a great idea! I always have old crayons lying around, amazing use for them. Melting crayons is one of my most favorite things to do. Love love love. Oh my gosh, brilliant! I love it. I want to make one of my own! I would pour it into a mold, such as another can or glass dish. Then I would drop pieces of crayon into it or shavings as it was cooling down. If I wanted a colored candle I would just melt the crayons directly into the candle wax while over the heat and stir with a stick. The confetti ones in clear paraffin were my favorites. I would stick a wick in while it was still hot and tie it to a pencil over the can. When it cooled I just removed it by heating the outside of the can a little by hot water and it slid right out. Nothing professional, but it was just my craft to do when an early teen with things we had around the house. I didn't have any money to spend so I used what I had. 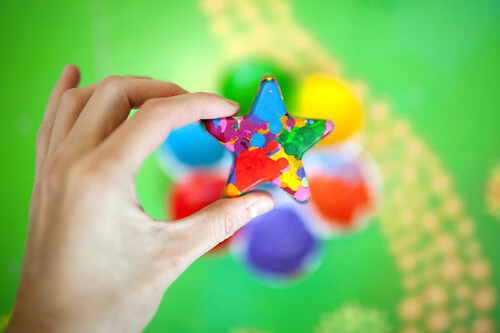 I also melted them together into a larger crayon like the star shown here. I'm waiting for my grandkids to grow up another year or two and I'll make some of these for when they come to visit. I have a whole large bucket full of broken crayons I saved from my kids. The Crayola crayons are the best for pigment. Cheapo ones are terrible. WOW! love this last photo!! soo colorful!!! this is awesome! you have the best ideas! Hello! Hehe this is so cute :) as usual! You're my poet of the everyday... Thanks a lot ! btw, can you do a room tour? I love your room, it looks so colourful and your pics/posts always make me happy! I love your blog! I follow you! Wanna follow me back?? I wonder how could you never run cool out ideas like this, super! I did this as a kid with muffin tins - we called them "scribble cookies." this is something i like. i ADORE this!!! the colors are amazing! great DIY! Hi Katie! I'm new to your blog and I just want to let you know that I truly enjoy it here. It is so very inspiring! 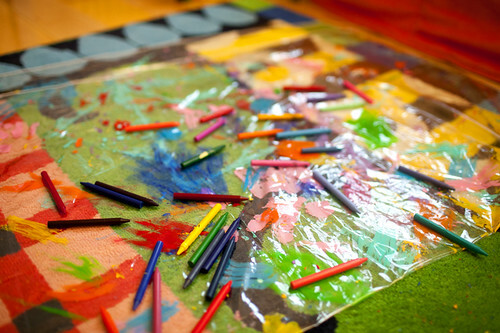 I love this melting of the crayons idea and will have to execute it with my 2 year old. Thanks! You have inspired me to do this with my kiddo. thanks. I love this idea and have been thinking about doing this for awhile! Thanks for the fun inspiration!